Antimitochondrial antibodies (AMA) are substances (antibodies) that form against mitochondria. The mitochondria are an important part of cells. They are the energy source inside the cells. These help the cells work properly. This article discusses the blood test used to measure the amount of AMA in the blood. A blood sample is needed. It is most often taken from a vein. 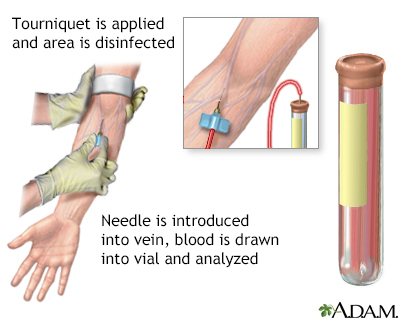 The procedure is called a venipuncture. Your health care provider may tell you not to eat or drink anything for up to 6 hours before the test (most often overnight). You may need this test if you have signs of liver damage. This test is most often used to diagnose primary biliary cholangitis, formerly called primary biliary cirrhosis (PBC). The test may also be used to tell the difference between bile system-related cirrhosis and liver problems due to other causes such as a blockage, viral hepatitis, or alcoholic cirrhosis. This test is important for diagnosing PBC. Almost all people with the condition will test positive. It is rare that a person without the condition will have a positive result. Rarely, abnormal results may also be found. This may occur due to other kinds of liver disease and some autoimmune diseases. Beuers U, Gershwin ME, Gish RG, et al. Changing nomenclature for PBC: From 'cirrhosis' to 'cholangitis'. Clin Res Hepatol Gastroenterol. 2015;39(5):e57-e59. PMID: 26433440 www.ncbi.nlm.nih.gov/pubmed/26433440. Chernecky CC, Berger BJ. A. In: Chernecky CC, Berger BJ, eds. Laboratory Tests and Diagnostic Procedures. 6th ed. St Louis, MO: Elsevier Saunders; 2013:84-180. Eaton JE, Lindor KD. Primary biliary cirrhosis. In: Feldman M, Friedman LS, Brandt LJ, eds. Sleisenger and Fordtran's Gastrointestinal and Liver Disease. 9th ed. Philadelphia, PA: Elsevier Saunders; 2016:chap 91. Zhang J, Zhang W, Leung PS, et al. Ongoing activation of autoantigen-specific B cells in primary biliary cirrhosis. Hepatology. 2014;60(5):1708-1716. PMID: 25043065 www.ncbi.nlm.nih.gov/pubmed/25043065.